The GoFundMe page that suddenly appeared for Dieseltec right after Brian Klawiter did his interview with WOOD-TV has been removed from the GoFundMe site by administrators for FRAUD. It has also been reported that Klawiter himself has a criminal past, and refused to have his business licensed. Criminal past, fraud, and an unlicensed business. Not there’s a REAL KKK-hristian. The crazy fake” Christians”are crawling out of the woodwork now that they have figured out that their hatred and bigotry might get some publicity and perhaps a GoFundMe page worth a couple of thousands of dollars. 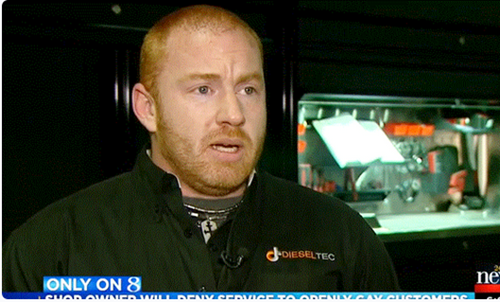 The owner of an auto shop in Grandville, Michigan has come out of his “hate shack” and said he will give discounts to customers who bring guns into his store but to refuse service to LGBT people. Brian Klawiter, the owner of Dieseltec Auto Repair o in Grandville, MI posted the statement to his company’s Facebook page Tuesday because he says the voices of those who have Christian, conservative values are often overshadowed by those who do not. Shortly after the interview aired a GoFundMe Page miraculously appeared out of nowhere. You can read KKKlawaiters full post below. As of this moment he has raised no money. Western Michigan is fairly conservative and religious but also has a large gay population. It will be interesting to see how this plays out. Already his yelp page is a disaster.